Conversations among teachers are critical to real change occurring in classrooms. Instructional coaches and teacher leaders are often tasked with facilitating team or PLC conversations that lead to actions to increase student success. I like that thought. “Conversations should be based on passion and hope.” The more time that PLC learning is driven by passion (the sense of urgency that exists in driving what members want to make happen for students) and hope (as a team of educators we can learn how to make this happen), the more energy members will invest. Here is a diagram I use for illustrating facilitation. The first is to spark the conversation among members. I see this step as often being part of the planning work done by the facilitator. 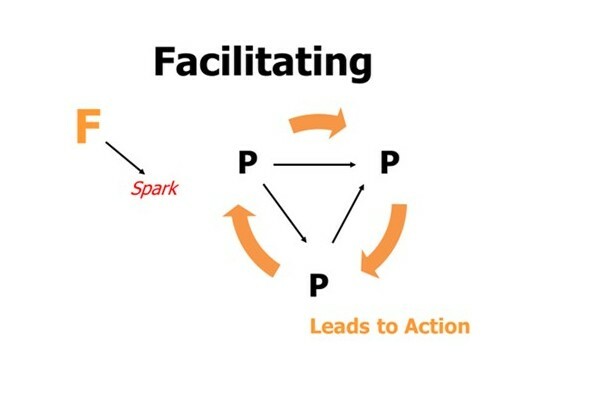 Knowing the agenda or goal of the group you are facilitating, what might spark (connect with passion or urgency)? The spark might come from an article, video clip, student work or data, observations from walk -throughs or classroom visits. An ongoing role of the facilitator is to keep the group moving toward action. Teachers don’t want to spend time in meetings that “go nowhere.” Taking action doesn’t need to mean that the team has a solution to implement. Action can mean researching, gathering information from other teachers, or experimenting with an idea. I suggest to PLC facilitators that 20 minutes is a good guideline of the time to begin moving a conversation toward “homework”. What actions will members take between this meeting and the next to further the conversations and progress? Sometimes a question for reflection that will be shared at the beginning of the next meeting is the action. To facilitate means “to make easy.” The group facilitator’s job is to make it easier for the group to do its work. By providing non-directive leadership, the facilitator helps the group arrive at the understandings and decisions that are its task. In a consensus group the facilitator’s focus is on the group and its work. The role is one of assistance and guidance, not of control. I often use questions as my “non- directive” leadership/facilitator role to guide groups to taking action on their goals. I recommend using the Questions for Life process to plan questions. 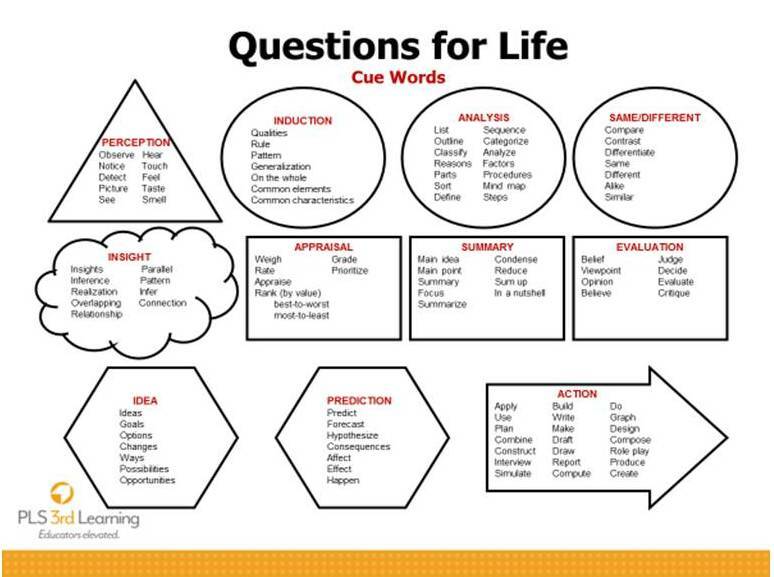 Download a copy of Questions for Life Cue words. Here is a set of questions I designed to facilitate a conversation around increasing differentiation. Questions are presented one at a time and teacher responses and questions can alter direction. PLC members agreed to bring a class set of student work to their meeting. Working with a partner, develop ideas for increased differentiation in the next assignment? (ideas) Ideas are then shared with the PLC. Too often, PLCs begin their work with the last question. The facilitator’s planning of the lead-up questions can “make the work easier” and progress greater. Here is a second model focused on student engagement. Teachers are asked to bring the last three days of instructional plans to the PLC session. Working with a partner, identify an idea for increasing engagement in an upcoming lesson. (idea) Ideas are shared with the PLC. Planning time on the part of the facilitator preparing the questions can very positively impact the quality of PLC conversation and actions. Thanks for the application of the Questions for Life in two different models. They are applicable to the consulting work I do in the pre- and post- observation conversations that school leaders have during the performance assessment process. Much appreciation, Steve, for sharing information about facilitating conversations with specificity and examples.